I have wanted to try something from the Neals Yard Remedies range for a loooong time. It was Christmas 2012 that my friend introduced me to their range via their Facebook and since then I have been lusting after their products, but without the budget to buy myself some! I’m always a little dubious about buying products from ranges I haven’t tried before, especially when I can’t get to a shop for advice or to test out the products, but since 2012 something amazing happened. I won’t try to explain the concept of an Isle of Wight garden centre to the big wide world, but over here they are something pretty special. Local green finger phenomenon, Busy Bees (aka Christmas WORLD) recently expanded their store (making Island-wide news for months of course) and had the decency to add an amazing health food and natural cosmetics section… for whatever reason! I was overjoyed, and this saw the introduction of Neals Yard Facial Care to the Isle of Wight – so I finally decided it was time to treat myself. 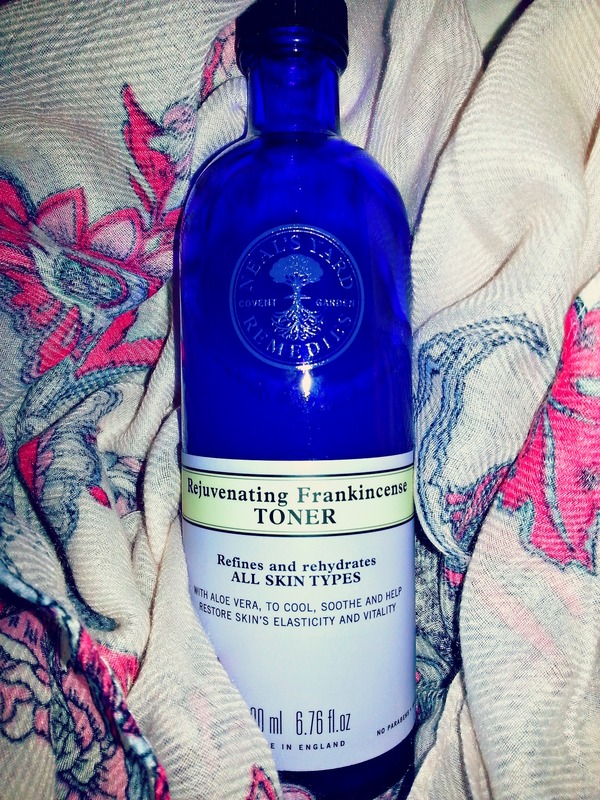 I love a good toner, and it just so happened that I actually needed something for my daily skincare regime, so I picked up the Rejuvenating Frankincense Toner, which is suitable for all skin types, and designed to absorb sebum and moisturisers, resulting in wonderfully balanced skin! This is absolutely perfect for my combination/oily which skin becomes incredibly unbalanced (my main skin concern) and is notoriously adverse to most moisturisers! This toner is available in a gorgeous 200ml bottle, which takes pride of place on my dresser – it looks absolutely stunning, and definitely makes me want to expand my NYR collection! At £20.50 I think it is great value – I have been using mine daily since the beginning of December and have barely gone below the neck of the bottle – I expect it will last me a good 6 months or so. The toner is light in consistency, and smells really herbal and amazing. I haven’t used frankincense in skincare before, but I’ve been impressed so far! It doesn’t leave a greasy residue at all, and does really well at refreshing the skin in the morning if you cleanse at night. My only complaint is that it takes a couple of minutes to fully dry, but it really isn’t any hassle. This product is 97% organic, so it’s definitely a skincare purchase you can feel good about. I think this will definitely work it’s way into my skincare regime for the foreseeable future, and I can’t wait to discover other Neal’s Yard Products! If you have tried some please please do share them in the comments section below! You can buy your own Frankincense Toner here!